Colton Haynes just got engaged… again. 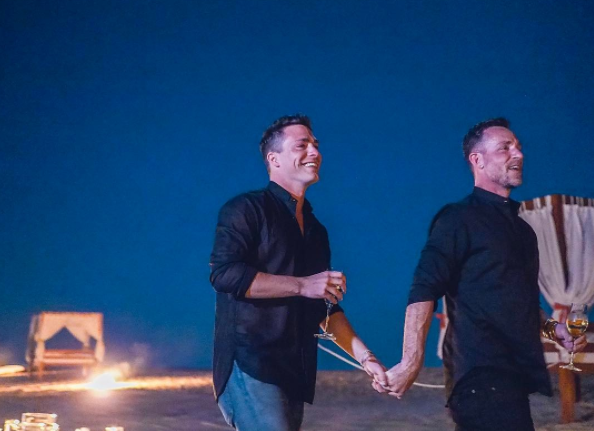 Colton Haynes got engaged to his fiancee again because apparently one time wasn’t enough. This past Sunday, 28-year-old Colton decided to return the favor. While the couple was hanging out by the pool over the holiday weekend, he dropped a diamond encrusted ring into Jeff’s glass of Dom Perignon while Sonny and Cher’s “I Got Your Babe” played softly in the background. Okay, it’s becoming a bit much, no? Thank you. Like can you get to work on some flower arrangement or movie script already. Yes, it’s a bit to much. I like him, but he is a bit intense. Yes, we know. I’ll bet they would never have gotten engaged if they didn’t have access to a camera. Ugh. He just had to let us know it was a glass of vintage dom perignon. This whole romance is so stage managed and media aware. Superficial attention whores. Look, let me be blunt: If Colton Haynes had asked me to marry him, I’d be hoping I didn’t wake up. The couple is in love and this may be the very first love for Colton. I still remember my First Great Love and, some 40 years later, my heart still skips a beat at the thought of him (terrific, now I’ve got “Endless Love” running in my head, gahd). Let the man enjoy love. So, he’s a little over the top. Love is over the top. They both want to propose? Fine. Let the two of them enjoy and stop being such spoilsports. No. Clearly they want our opinions since they feel the need to share their love with us so much, so I will gladly oblige their voyeurism and opine on how over the top and nauseating it’s becoming. Xzamilloh, when one receives a wedding announcement, that is not an invitation to comment on the suitability of the groom or how far along the bride-to-be is. It is an announcement, not a discussion. People love to share good news, particularly news that has brought them joy and happiness. I rather hope, when some relative sends you a birth announcement, you don’t feel compelled to comment the actual cuteness level of the child. BTW, to “oblige their voyeurism,” you’d have to let them watch you get engaged. You are obliging their exhibitionism. WAY over the top, needy and desperate and those “diamond encrusted rings”…past tacky. It just seems like they’re trying too hard. Can’t stand this attention whore, get married already, adopt five kids, get divorced, and shut the [email protected] up already. Ah the jealous loveless Mad jackals are howling it up again. Momma’s boys are the worst. I think it’s totally f$$king hot, everything about it is love. You go boys, sooooo best of luck to your long life together. Because apparently you are of the opinion that if it isn’t on Instagram it isn’t love. On my side it’s that I liked Haynes just fine. But this all seems so ridiculously stage managed it’s a bit gross.